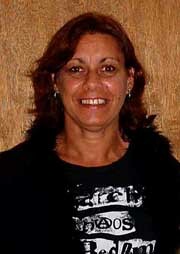 My name is Lorraine Kirk my Aboriginal name is Nyngala. I am Aboriginal and was born in Wondai Qld. My father is from the Wakka Wakka tribe in Queensland and my mother is from the Worimi tribe in NSW. I have four children, now young adults. I have travelled extensively around Australia and it was while I was in central Australia that I was given the opportunity to paint using traditional stories. I have been painting for the past 9 years. I now live in the Mareeba area and enjoy bushwalking, camping, swimming and fishing as well as painting and making Aboriginal artefacts.